Aerial view of Lummi Island. 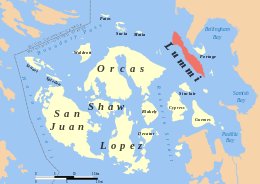 Lummi Island lies at the southwest corner of Whatcom County, Washington, United States, between the mainland part of the county and offshore San Juan County. The Lummi Indian Reservation is situated on a peninsula east of the island, but does not include Lummi Island. The island has a land area of 23.97 square kilometres (9.25 square miles) and had a population of 822 as of the 2000 census. The population nearly doubles in summer when property owners from both Canada and the U.S. arrive for summer fun and relaxation. The island is accessible by a 22-car ferry, the Whatcom Chief, run by Whatcom County Public Works. It is a 6-minute passage from Gooseberry Point on the mainland to the island. Facilities on the island include one general store, two restaurants, several bed and breakfast houses, a small library, post office, fire station, one church, a Salvation Army camp, and a vintage 1919 elementary school. The Beach Store Cafe is a popular local hangout with a small bar, and serves seafood and traditional café fare. The Willows Inn serves more expensive fare, featuring seasonal treats from island farms and fishers. The historic Lummi Island Congregational Church has a quiet, wooded cemetery. Lummi Island is best known for its unique reefnet salmon fishery, eclectic population of artists, picturesque seascapes, and rural setting. Its narrow, scenic and winding roads are popular with bicyclers. A trail to Lummi Mountain takes hikers through the Baker Preserve to stunning high views of the San Juan and Gulf islands. The trail is maintained by the Lummi Island Heritage Trust. Public education for island residents is provided by the Ferndale School District. It operates one elementary school (K-5) on the island, Beach Elementary School. Middle and high school students attend schools on the mainland. The island was originally called Sa nam a o ("High Mountain") and Skallaham by the native Lummi people. In 1792 Spanish explorers dubbed it Isla de Pacheco, and British colonists later called it McLoughlin Island. In 1853, the U.S. National Geodetic Survey charted the island as Lummi, naming it after the local tribe. Later British and Americans adopted this term. When the explorers saw upon arrival and whence the tribe also took their name, Some theories suggest the name was derived from a Lummi-language word. The island's post office was established by the United States government in 1882. At that time the town was called "Beach, Washington," which was the name of the town. Today Island mail is addressed to "Lummi Island, Washington", though the Beach School and Beach Store Cafe retain the "Beach" community name. By 1919, the Nooksack Fish Packing Company also had a cannery on the Island at Sunrise Cove. The island hosts a weekly farmers' market in the spring and summer, a chili festival in mid-July, and a Christmas party for island children. Lummi Island is home to numerous artists who conduct studio tours on Memorial Day weekend, Labor Day weekend, and the second weekend in November. The climate in this area has mild differences between highs and lows, with wet winters and dry summers. According to the Köppen Climate Classification system, Lummi Island has a marine west coast climate, abbreviated "Cfb" on climate maps. Commercial Fishing A fishing method practiced by the Indians of Puget Sound. This page was last edited on 11 December 2018, at 12:31 (UTC).